LEXINGTON, Ky. (June 20, 2017) — A team of University of Kentucky students, led by College of Engineering Professor Suzanne Smith, is preparing to launch two high-altitude weather balloons on Aug. 21 as part of a nationwide, NASA-sponsored project to livestream footage of the 2017 total solar eclipse. The August eclipse will be the first time in 99 years that a total solar eclipse will cross the entire nation. Over the course of 100 minutes, 14 states will experience more than two minutes of near darkness in the middle of the day as the moon passes between Earth and the sun. A partial eclipse will also be viewable across the continent. Today, the team is participating in a national practice launch to be monitored by NASA. 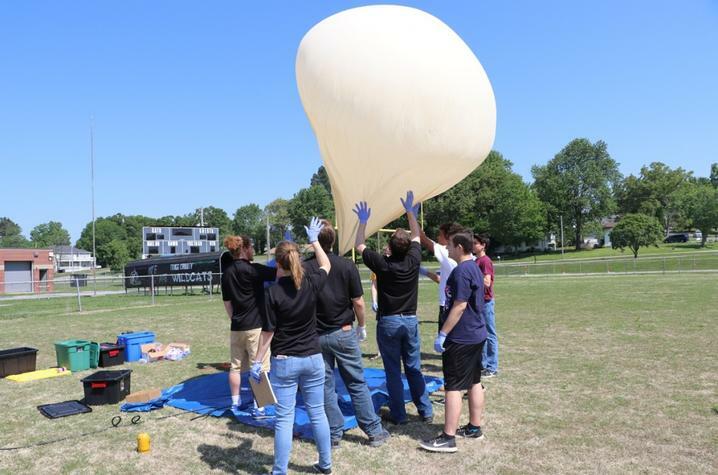 At 1:15 p.m. (12:15 p.m. CST), Smith and students will launch two balloons at the Russellville-Logan County Airport to test equipment and software. If weather and systems cooperate, the balloons will be livestreaming from the edge of space at http://eclipse.stream.live. "We have done a lot of practices this past year, but this is the dress rehearsal," said Mollye Malone, a rising junior studying biosystems engineering and a team leader for the eclipse project. 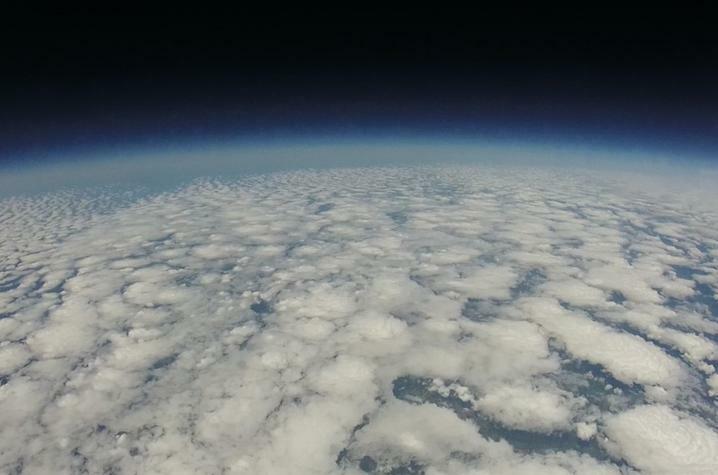 UK students have spent more than two years building cameras and location-tracking software to be carried to the edge of space by the balloons. 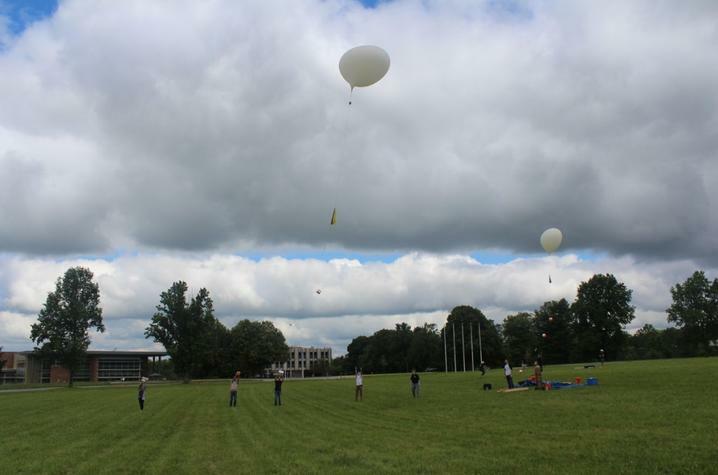 During the practice launch, the team will be paying close attention to the range of their ground stations, which track the balloons to receive video and still images. The balloons have previously reached altitudes of 20 miles or around 100,000 feet. "We'll figure out what the limit is and what we can do to expand that range, in case the balloons go further," Malone said. But what keeps Malone up at night isn't the tracking — it's the wind. Launch time for the UK team during both the practice test and launch in August is at noon, when winds are often stronger. Thankfully, the team is supported by faculty at UK and NASA Kentucky who bring a wealth of experience to the project. Experts like Smith, the Donald and Gertrude Lester Professor of Mechanical Engineering and director of NASA Kentucky, have been conducting balloon launches since 2002. But this project is a unique opportunity for all involved, Smith said. "Students are getting to experience the way NASA runs huge projects — they're getting to see systems engineering and testing and the process of it all," she said. More than 50 other teams across the U.S., including Bluegrass Community and Technical College and Hopkinsville Community College, are participating in the eclipse project, launching and livestreaming the celestial event at different points along its path and at different times. On Aug. 21, the team will launch near Hopkinsville, Kentucky, which is the point of greatest totality — essentially the prime place to glimpse the eclipse in all its fullness. In Lexington, the eclipse will be at nearly 90 percent totality around 2:30 p.m. UK’s live videos can be seen along with others on the map of the full path – from Oregon to South Carolina – at eclipse.stream.live. After the practice run today, the teams will get in touch to discuss issues and share tips. NASA is also kicking off its eclipse events with a press conference on Wednesday, June 21, detailing safe viewing practices and other information. Visit http://solareclipse.engineering.uky.edu for more information about the UK team.